If you are already logged on to HUB, refer to Step 1. If you are on the HUB log on page, refer to Step 3. Click the User icon in the top right‑hand corner, and in the drop‑down menu, select Change password to navigate to the Change your password page. On the HUB log on page, click the Change your password link to navigate to the Change your password page. On the Change your password page, enter your College user name and current password, and then click Continue. On the Change your password page, click the Show/Hide password policy link to review the password policy requirements, record your College‑issued user name, enter your new password, confirm your new password, and then click Change my password. NOTE: If you are changing your password for the first time in HUB, the Set your security questions page will open, click the More information link for tips on choosing effective questions, enter questions and answers for all three security questions, and then click Change my password. To revise your security questions, click the User icon in the top right‑hand corner, and in the drop‑down menu, select Profile. IMPORTANT: If you have recently changed your password on your computer but have not changed your Wi‑Fi and email account password on your cell phone or laptop, your devices might try to automatically log on using your old password and will be locked out. To fix this problem, update your stored password in all locations, wait 30 minutes, and then try to log on again. Refer to the Unlock your College account webpage for additional information. On the HUB log on page, click the Retrieve or claim your account link to navigate to the Retrieve or claim your account page. 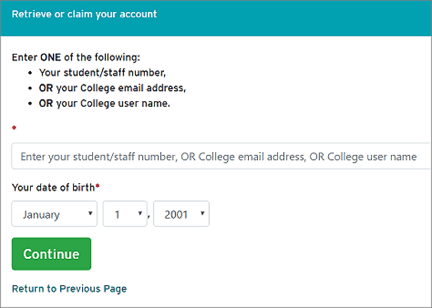 Enter one of the three available options so we can verify your identity, enter your date of birth, and then click Continue. Use the Student Service Centres as your first point of contact for help resolving your password and account information issues. If you have contacted the Student Service Centres and still cannot access your account, contact IT Solutions at its‑information@rrc.ca for assistance. Please email IT Solutions only when all other methods of accessing your account have been unsuccessful. Confirm that your email on file is correct (if it is not, click the manual instructions link), and then click Continue. Retrieve your temporary reset code from the email address identified in Step 3, enter the code into the Reset Code field, click Continue, and when the Change your password page opens, you can reset your password as described in Step 5. IMPORTANT: Your temporary reset code is valid for only one hour. If you do not use your reset code before it expires, refer to Step 1 to receive a new code. 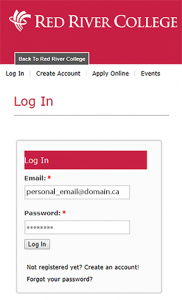 NOTE: If you have recently applied to Red River College using the Apply Online application, the email associated with your Apply Online account is the same email you used when you initially created your account. If you have previously applied for, and been admitted into, a College program, do not attempt to log on to the Apply Online system using your student log on credentials. If you cannot access your account, refer to the Student Service Centres for assistance. 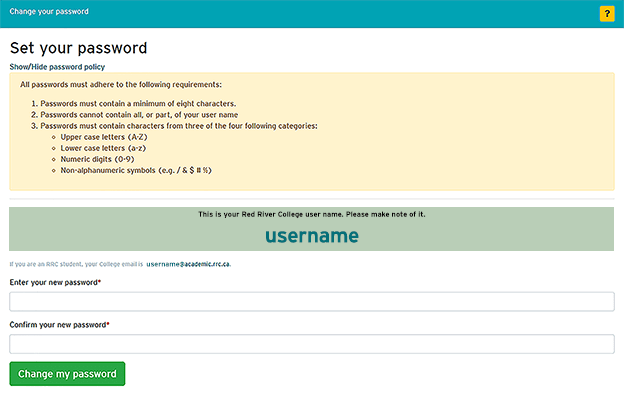 To create a secure password that adheres to Red River College’s password policy, refer to the Create a strong password and Password policy webpages for information.